Strawberry sundaes have gone out of style. As each new generation comes up with favorite ice cream flavors (Cookie Dough, Peanut Butter Cup, Red Velvet Cake), strawberry, an “original” ice cream flavor, has receded into the shadows. When was the last time you saw, much less ordered, a strawberry sundae? Today, National Strawberry Sundae Day, is the time to give this classic its due. You can make it with vanilla or strawberry ice cream—or both. You can use frozen yogurt instead of ice cream. You can combine a scoop of strawberry ice cream with a scoop of strawberry sorbet. You can even go Creamsicle-style by combining strawberry sorbet with vanilla ice cream. Since lush summer strawberries beckon, there’s no need to buy a cloying, HFCS-laden strawberry syrup. Here’s all you need to do. An easy way to have a strawberry topping is to puree fresh or frozen strawberries. Before you sweeten the puree to taste, consider adding some Grand Marnier or other liqueur. Alternatively, use good strawberry jam or as a base for a sauce. It will be sweet. Then, taste and sweeten as desired. There’s no need to sweeten the syrup if the strawberries are very sweet. Here’s the recipe for photo #1. The other photos are pretty easy to figure out. 2. PREPARE the strawberry sauce. Dilute strawberry jam with orange liqueur to taste. Add lemon juice to taste. Add a tablespoon or more of warm water to achieve desired consistency. 3. SCOOP ice cream/sorbet into dish. Top with strawberry sauce, sliced strawberries and optional whipped cream. Dig in. 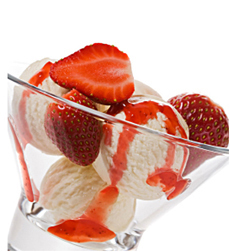 A strawberry sundae with vanilla ice cream (photo courtesy Bonne Maman). 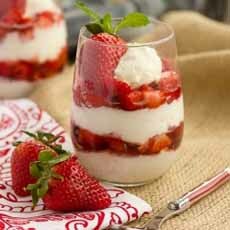 A strawberry sundae, parfait style (photo courtesy Foodgawker). 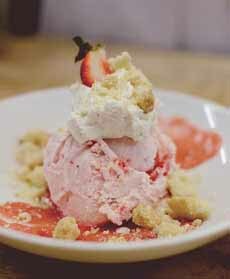 How about a strawberry sundae with a crumbled pie crust (or cookie) topping? A new way to look at pie à la mode (photo courtesy McConnell’s Ice Cream).